Sergio Panelo has been an educator for 14 years in the Mapleton school district outside of Denver, where 68 percent of students qualify for free or reduced lunches. More than 40 percent are second-language learners. Few students have gotten close to the mountains that surround them. “We are in a tough area,” he says. Still you might catch him brandishing a sign that announces, “I’ve introduced 500 people to snowboarding!” That’s right, snowboarding. 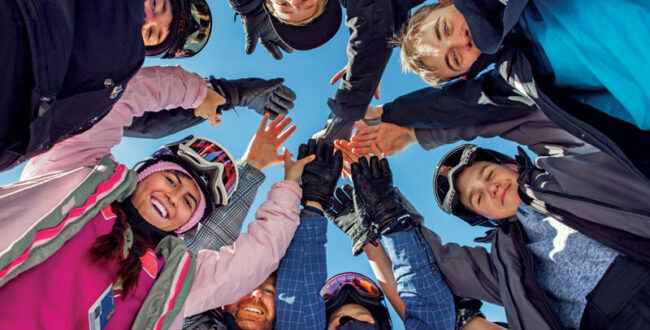 Panelo coordinates a district-wide program, called SOS Outreach, which leverages mountain sports, volunteer teachers and mentors, and a motivating record of success to help students transform their lives. In his first six years with SOS at a school called MESA, every one of the valedictorians was an SOS member. This year, he’s welcoming back an SOS member and volunteer who now attends Stanford University. As a national organization, SOS focuses on six core values, including courage and humility (think new experiences on very big mountains). The program runs over a four-year period, starting with five days of mentoring and sports, plus three days of service learning. By year four, members have developed their own service projects and taken leadership roles. Ninety-six percent set their sights on college. Sixty-one percent of SOS graduates return to serve as peer mentors. Why does it work? On the hills, kids learn determination and compassion. “When you fall,” Panelo says, “strangers retrieve your goggles. That’s a surprise for some kids.” But outdoor sports are just the stage set; personal interactions are the year-round strategy. “We use passion-based activities to connect young people with mentors, which eliminates all the awkwardness that could happen in relationships focused solely on mentorship,” explains Executive Director Seth Ehrlich.